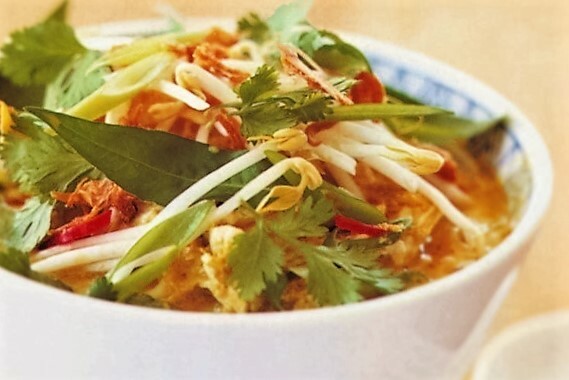 Laksa is a popular spicy noodle soup and a combination of Chinese and Malay cuisine. It’s basically rice noodles or rice vermicelli with chicken, seafood, pork, vegetables, tofu, or a combination of the lot! 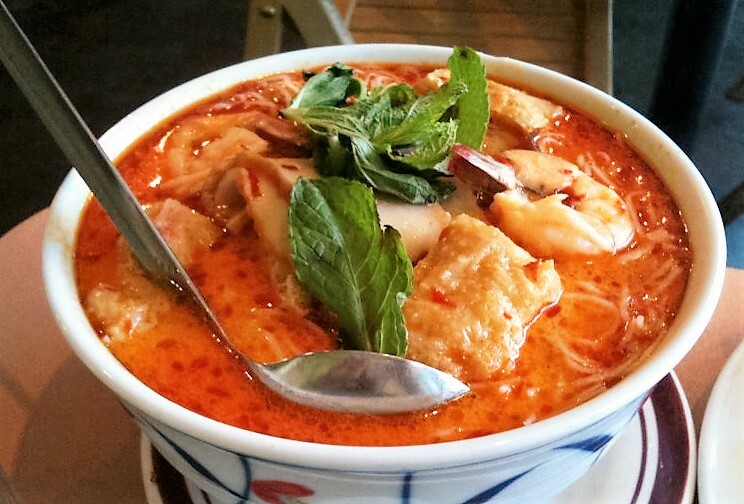 It gets its spicy taste from either a rich curry, or sour asam. I have to admit that I’ve never been a huge fan of laksa. I usually find it too filling, too hot, or often too hard to actually eat without making a total mess! But in our travels around Asia, laksa is served everywhere in a gazillion (yes that is a word) different ways. So after trying a couple of different laksa dishes, while I wouldn’t say I was complete convert, I was prepared to give a little and try out a few recipes at home. What we came up with was a super-easy cheat laksa which is gluten-free (rice noodles), low fat (lite coconut milk) no added sugar, and not too filling. One thing we did cheat with (yes we admit it) was to use a jar of laksa paste—much easier than measuring and grinding your own, and we chose Ayam paste as it’s readily available. 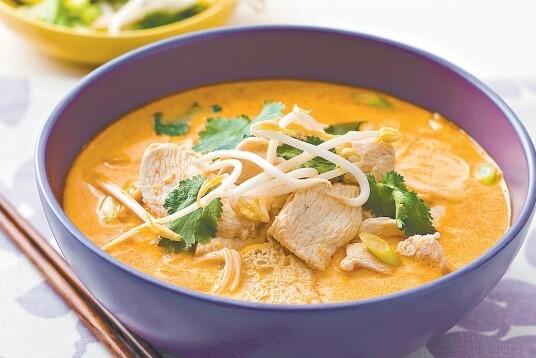 You can make a basic laksa base and ring the changes by adding whatever you like. We started out with the basic ingredients and made a chicken and mushroom laksa, a seafood (white fish, prawns and scallops), and a vegetable laksa—all of which were totally delish! And, one thing we’ve really learnt to love about laksa is the way the colours, as well as the ingredients, come together. The green onion and coriander, the red chilli, the white sprouts, and the limes are a really lovely colour fusion. So check out our super-easy recipe and a few mouth-watering photos—and give it a go! Place the noodles in a large bowl and cover with boiling water. Soak until tender—check after 15 minutes. While the noodles are softening heat oil in a wok over a high heat and stir-fry in the white part of the shallot for about 30 seconds. Add the laksa paste and stir well. Add the stock and coconut milk and bring to the boil. Simmer for 5 minutes. Add the sliced chicken and mushrooms and simmer for 3-4 minutes until tender and cooked through. Add the capsicum and chilli and simmer for 1 minute, then stir through the green part of the shallot, bean sprouts, and herbs. Drain the soft noodles and divide between two bowls, cover the noodles with the laksa, and add a squeeze of lime to each bowl. Serve immediately. If you are serving four or six people just increase the ingredients accordingly. 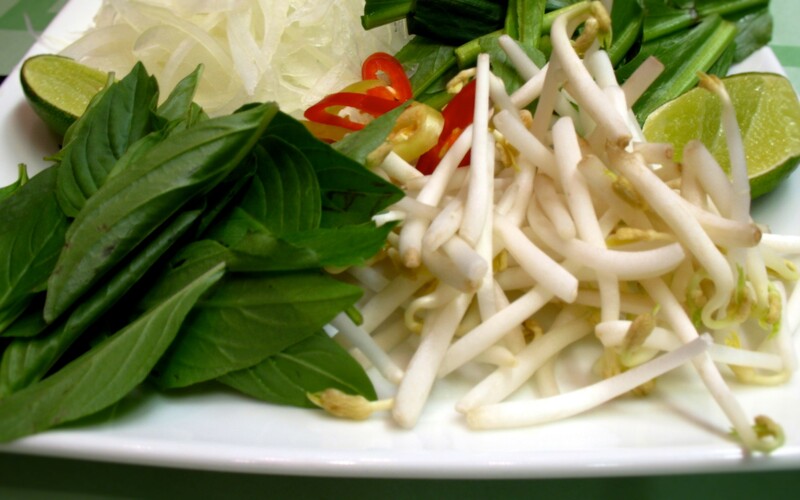 A nice way to present this if you’re serving a group, is to omit the final five ingredients (chilli, green shallot, bean sprouts, herbs, and lime) and serve them separately in small bowls as a table centrepiece so guests can help themselves. This way they can make it as hot (with the chilli) and as colourful as they like. 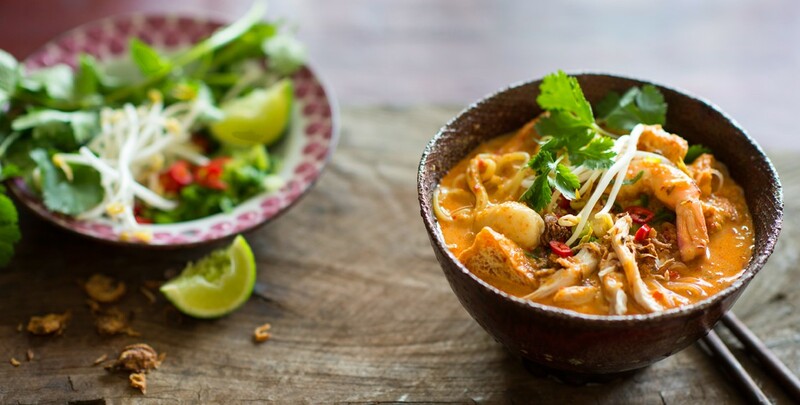 You can make a simple seafood laksa by substituting the chicken and mushroom for 200g boneless white fish fillets—flaked into pieces, about 4-5 prawns and 3 scallops per person, and use fish stock instead of chicken. If you are making a vegetarian laksa it’s a good idea to pre-cook any root vegetables first as they take a while to soften up. Cauliflower, broccolini, mushrooms, bok choy, and most Asian vegetables are perfect; together with bean sprouts, and red and green capsicum. This entry was posted in LFW Fit and Healthy, LFW Food&Wine and tagged Ayam laksa paste, chicken laksa, laksa with rice noodles, Malaysian laksa, seafood laksa, super easy laksa, vegetarian laksa on August 25, 2015 by gracienumber1.